One of the few drawbacks of the original Moon was its limited control scheme--no fault of the game or its developers, as the DS never lent itself well to FPS. Aiming with a stylus was a great idea on paper but often led to hand cramps in practice. For the remake Moon Chronicles, there are some new options. If you have a regular 3DS or 3DS XL you can still use the stylus, or move with the D-pad and aim with the face buttons, in an odd dual-digital scheme that some original DS shooters used quite well. 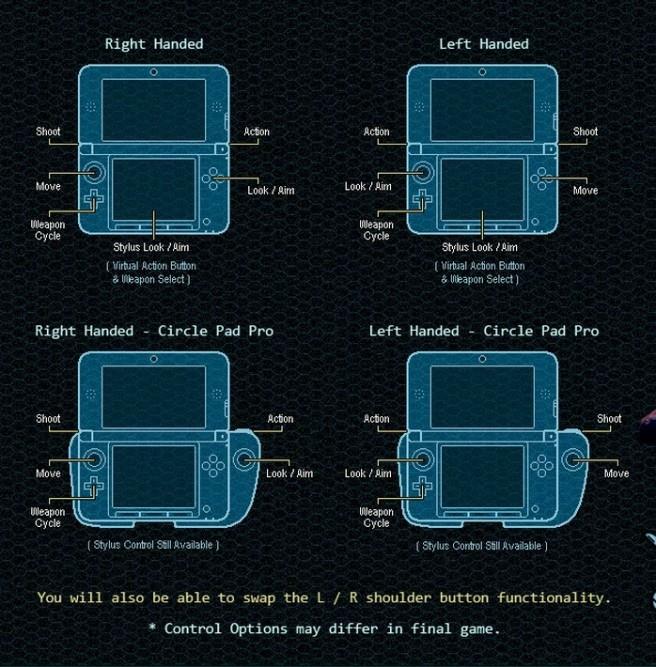 If you have the chunky Circle Pad Pro add-on for the 3DS you can even play in dual analog. I've been loathe to shell out for the Circle Pad Pro because it makes the 3DSXL even bigger and turns the XL's sleek profile into an unsightly bloated mess, but Moon Chronicles might just convince me to buy the ham-fisted peripheral. In any case it's great that Renegade Kid is taking all of these control schemes into account. The dual-digital scheme looks promising too, especially for people without a Circle Pad Pro or a thumb stylus to ease those hand cramps.